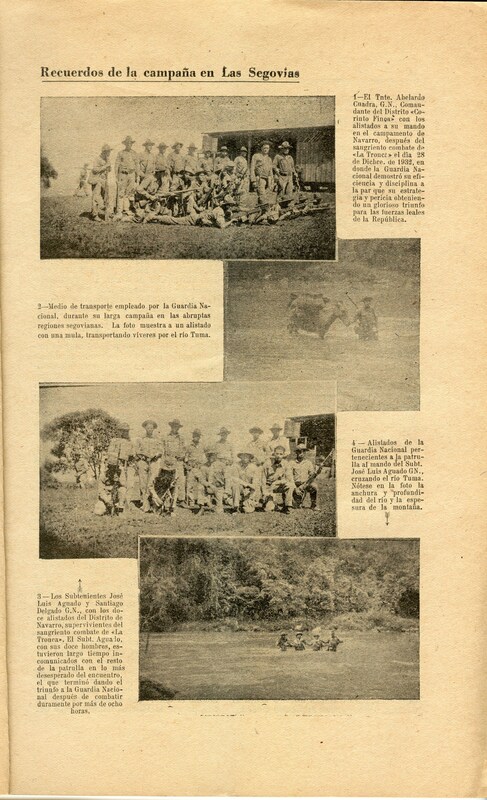 This page offers a collection of high-resolution digital images of the Boletines (Bulletins) produced by the Guardia Nacional and its Jefe Director Anastasio Somoza García after the US withdrawal in January 1933. 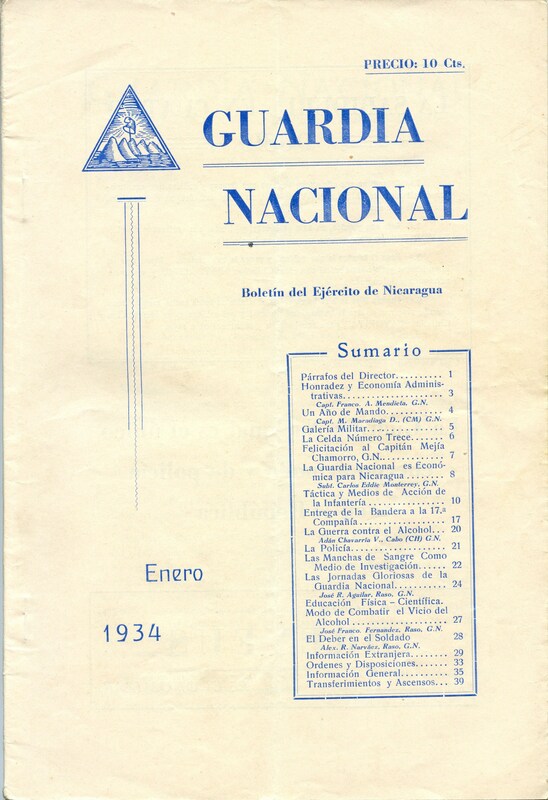 The successor publication to the "Guardia News Letters," and made with much higher production values, the Boletines were mailed to Brigadier General Dion Williams in Washington D.C., which is how they ended up in the archives. Only 17 issues made it into the archives (presumably only 17 were mailed), starting in June 1933 and ending in December 1935. It is probably not a coincidence that the mailings stopped only six months before Somoza's coup d'etat ousting the constitutionally elected president Juan B. Sacasa. 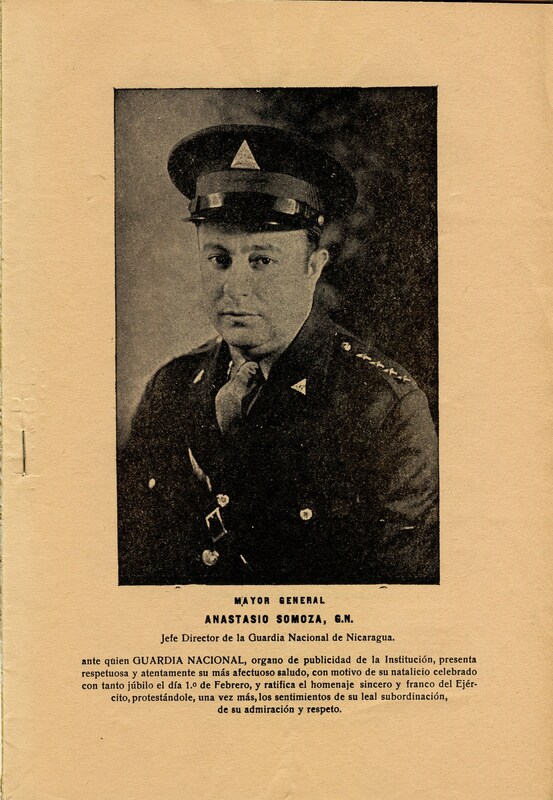 The Boletines comprise a powerful expression of Somoza's concerted efforts to cultivate a cult of personality around himself and to consolidate his own power by crafting a narrative in which he himself embodied & personified the highest ideals of the Guardia Nacional — the safeguard of order & civilization, of the nation, and of patriotism, duty, and honor. 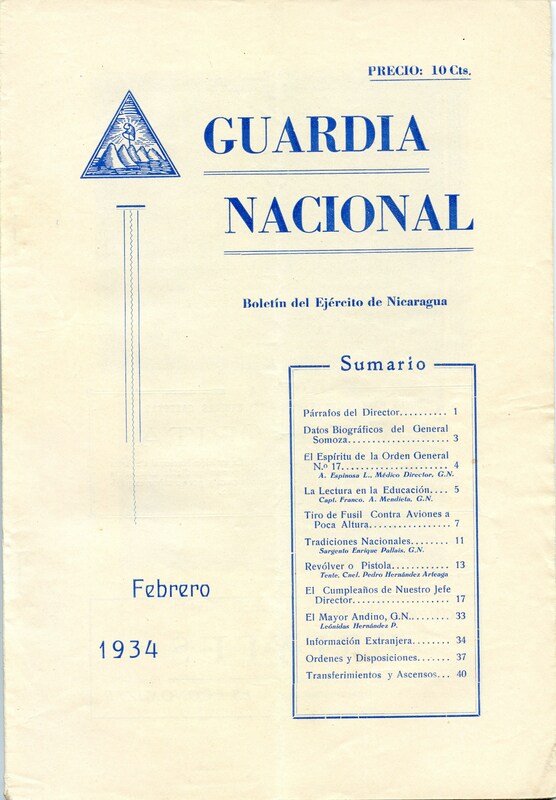 Covering a diversity of subjects, the most prominent themes are, first, the laurels & accolades bestowed upon the Jefe Director by Nicaragua's grateful citizenry, and second, the lofty ideals & principles to which all honorable Guardia officers & enlisted men aspired. 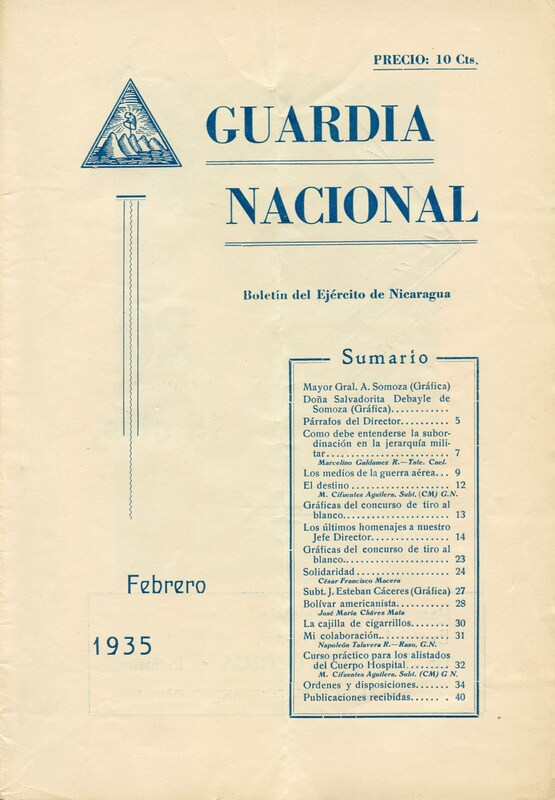 That these themes, and the larger narrative into which they fed, were largely concocted and bore little relation to reality matters less than the extent to which Somoza & the Guardia aggressively promoted them — both in the pages of the Boletines and in the political culture writ large. These Boletines offer a powerful & revealing glimpse into an emergent hegemonic narrative in the process of being constructed & disseminated into the country's larger political-cultural discursive field. 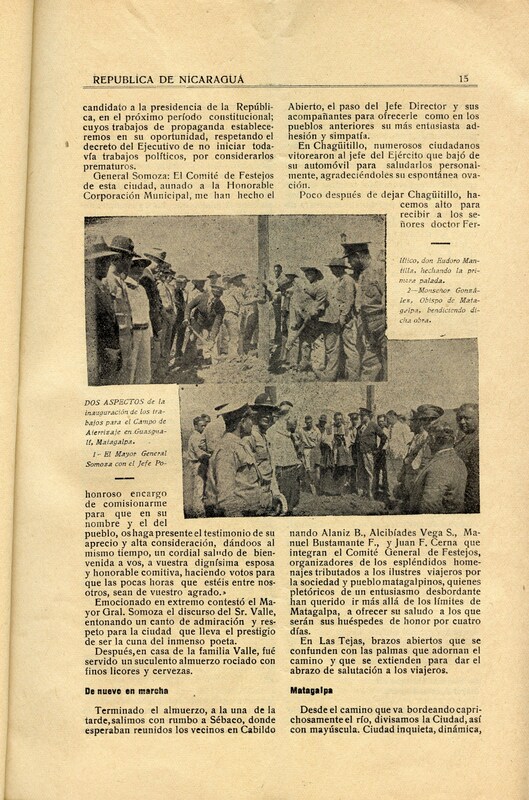 Febrero 1934, p. 1, con fotografía del Jefe Director de la Guardia Nacional, el Mayor General Anastasio Somoza García. 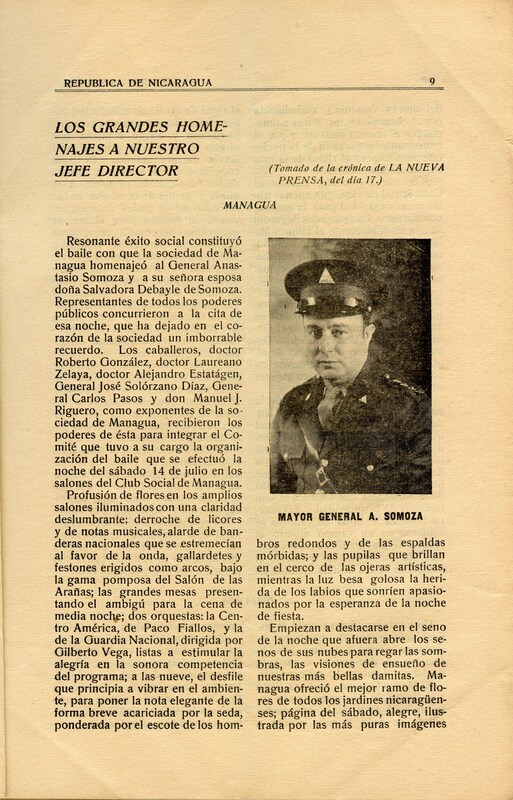 "Mayor General A. Somoza, Jefe Director de la Guardia Nacional de Nicaragua, quien con motivo de su cumpleaños fué objeto de sinceros homenajes del Ejército y la sociedad nicaragüense. "GUARDIA NACIONAL" le presenta su respetuoso saludo con los mejores votos por su ventura personal." 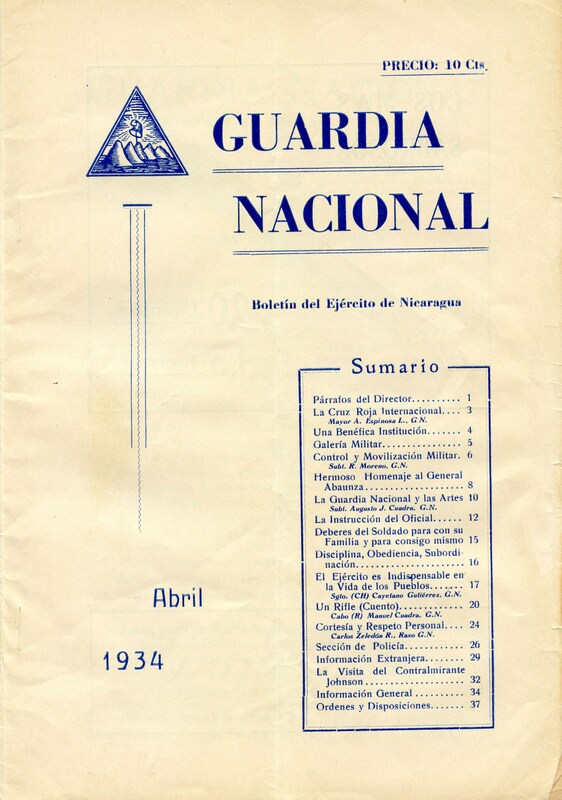 Abril 1934. Portada & Sumario. Mayo 1934. 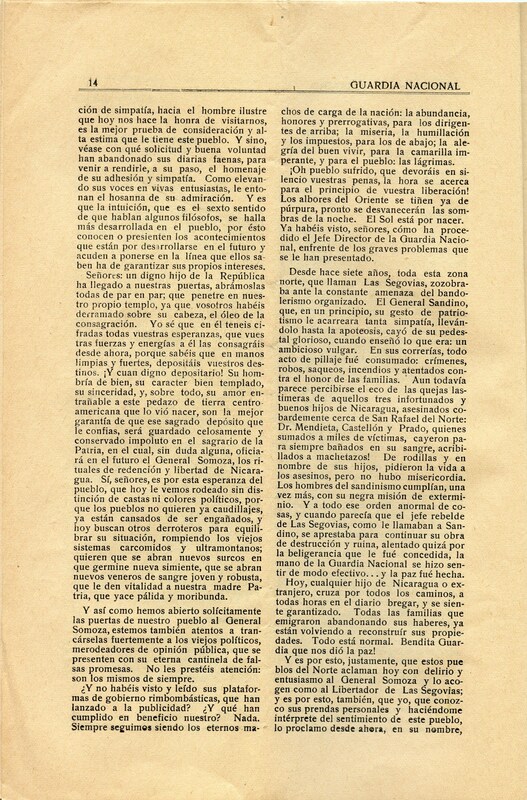 Portada & Sumarios. Mayo 1934, p. 4. 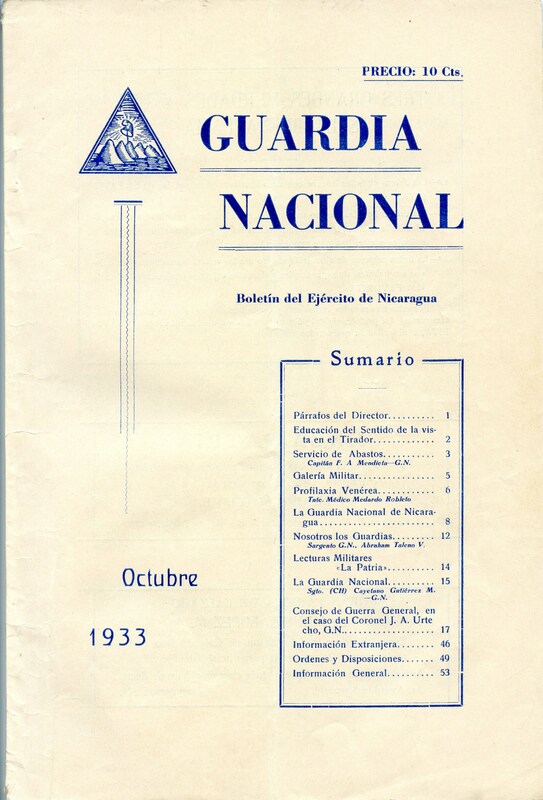 "Deportivas de la Guardia". Mayo 1934, p. 5. "Galería Militar. 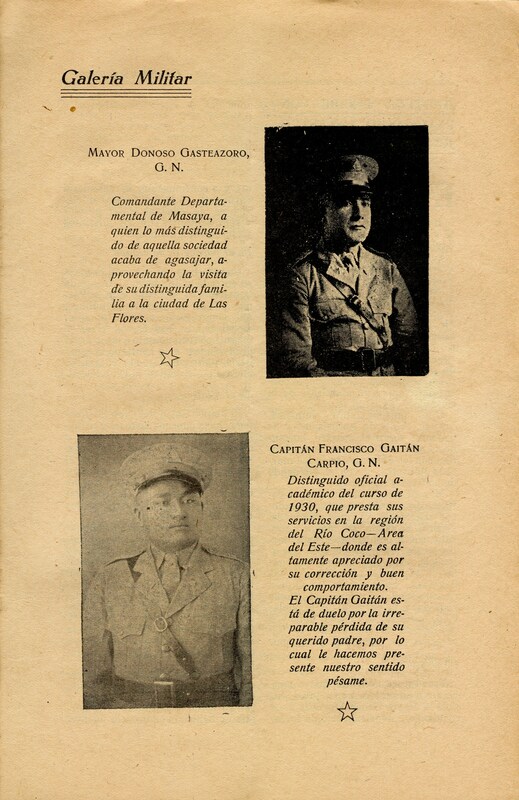 Mayor Donoso Gasteazoro, G.N. . . . Capitán Francisco Gaitán Carpio, G.N." Mayo 1934, p. 6. "Jinotega Recibe con Entusiasmo a Nuestro Jefe Director" (p. 1). Mayo 1934, p. 7. 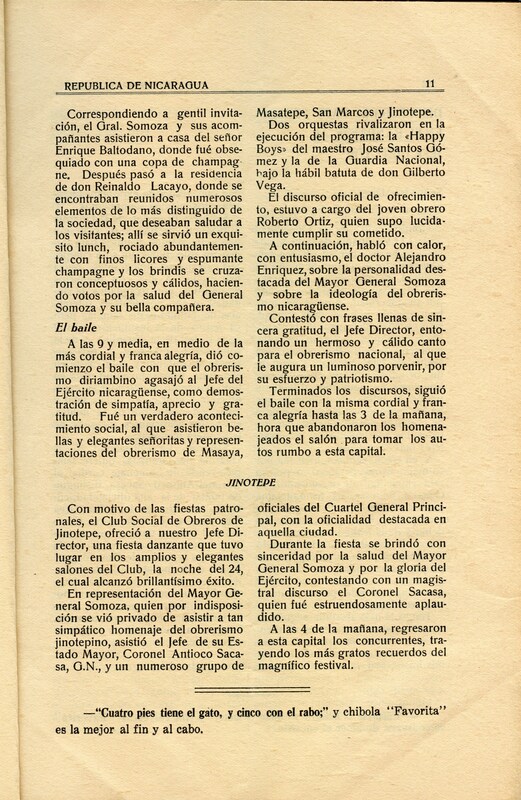 "Jinotega Recibe con Entusiasmo a Nuestro Jefe Director" (p. 2). Mayo 1934, p. 8. 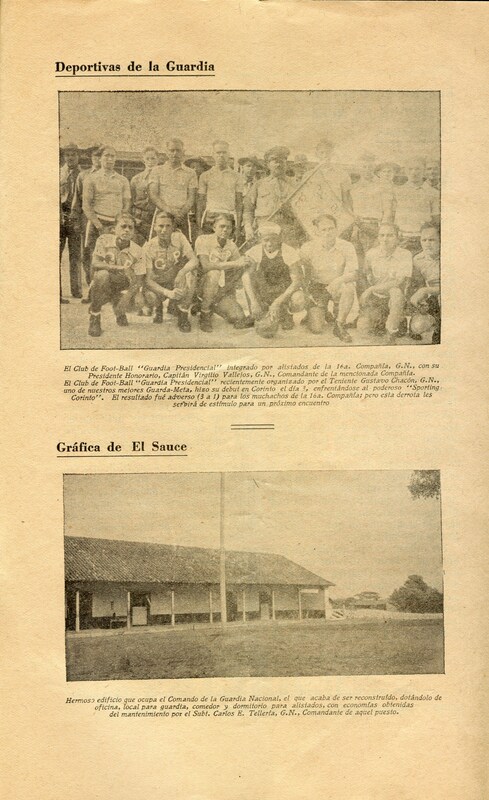 "Jinotega Recibe con Entusiasmo a Nuestro Jefe Director" (p. 3). Mayo 1934, p. 12. 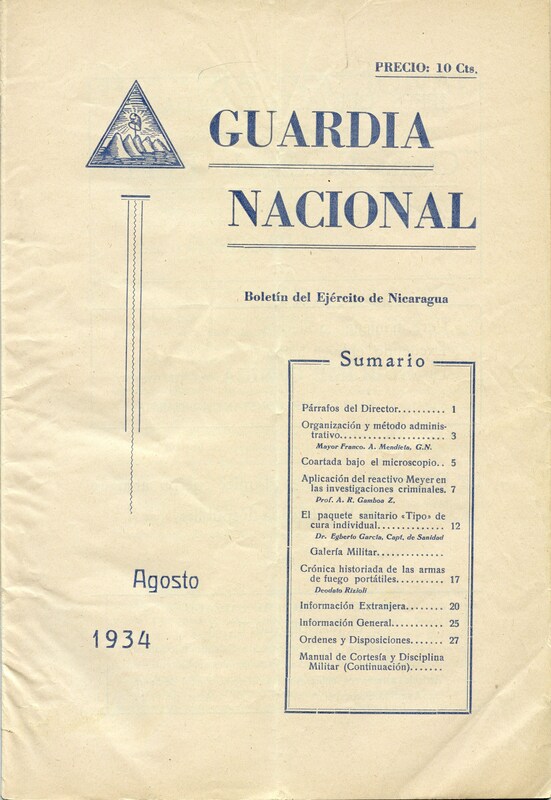 "Recuerdos de la Campaña en Las Segovias." Mayo 1934, p. 18. 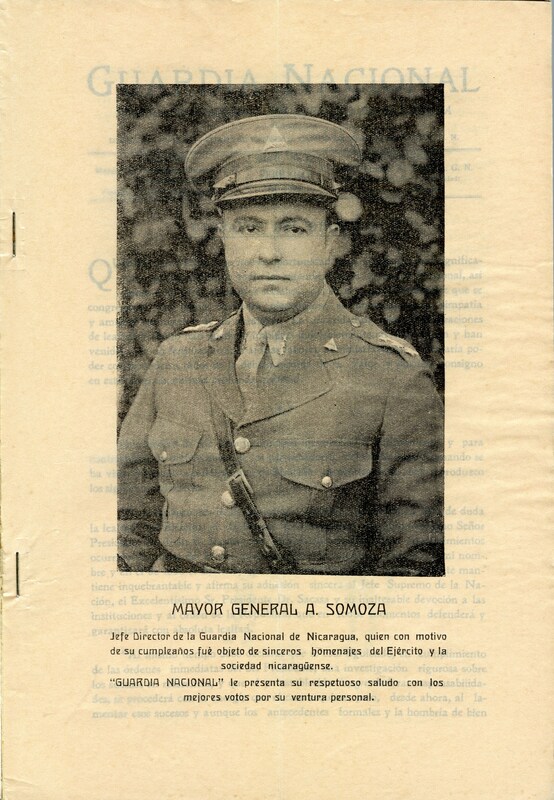 "Chontales Homenajea al General Somoza" (p. 1). Mayo 1934, p. 19. 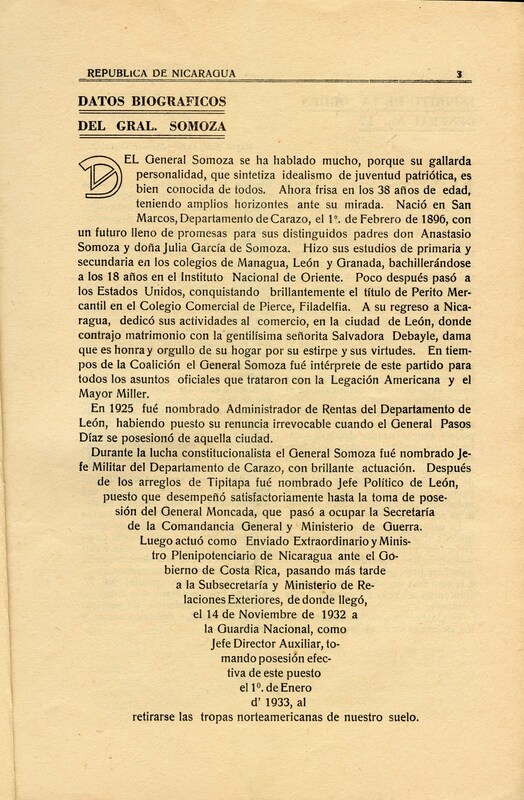 "Chontales Homenajea al General Somoza" (p. 2). Mayo 1934, p. 20. 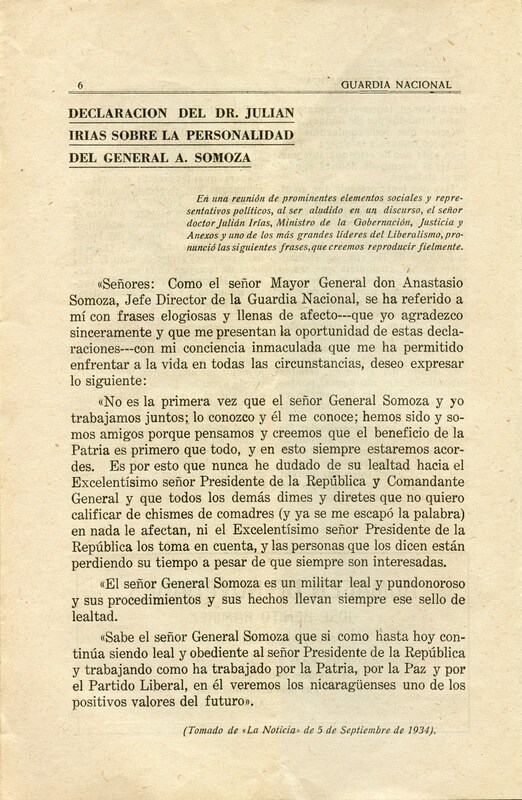 "Chontales Homenajea al General Somoza" (p. 3). 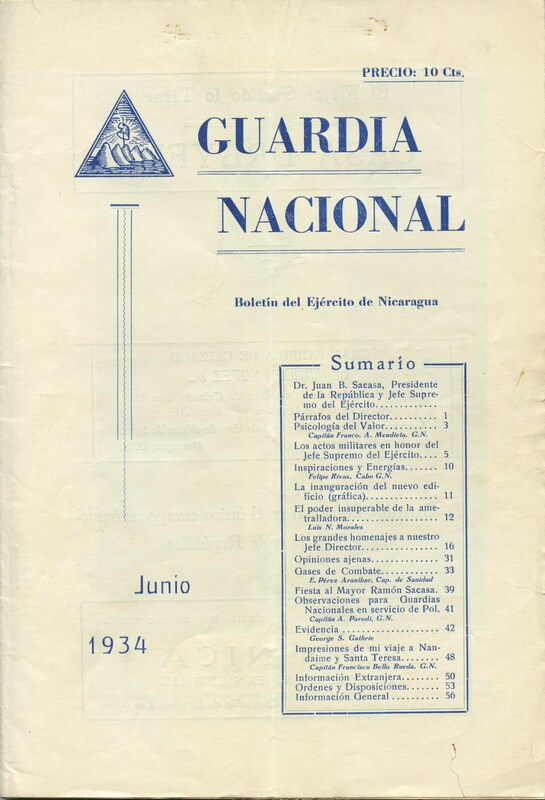 Junio 1934. Edición Completa. 59 pp. 34.2 MB. Julio 1934. Edición Completa. Parte 1: 20 pp., 11.1 MB. Parte 2: 28 pp. 13.9 MB. 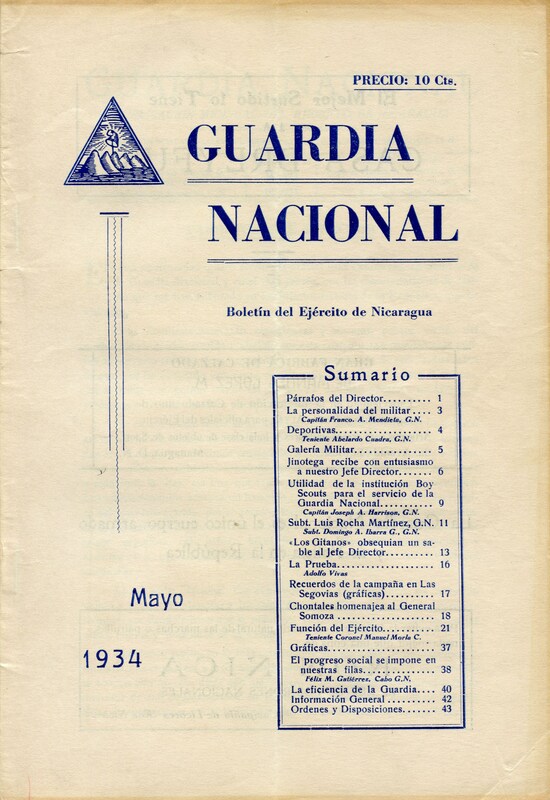 Julio 1934, p. 9. 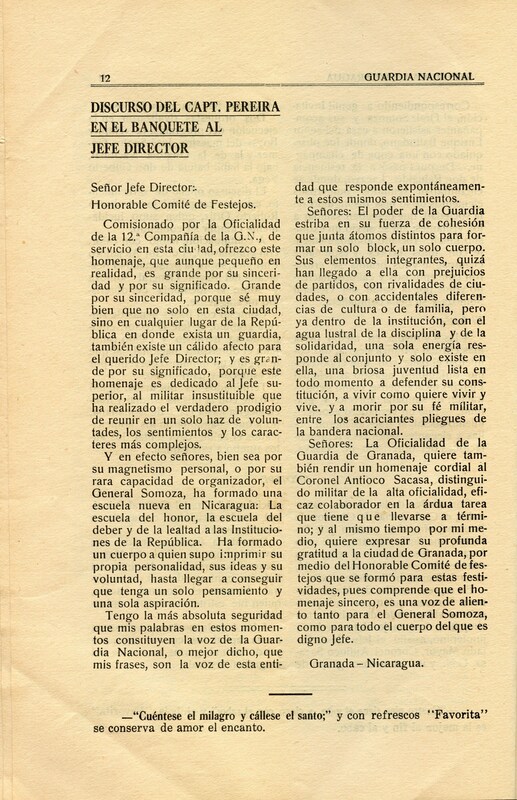 "Los Grandes Homenajes a Nuestro Jefe Director" (p. 1). 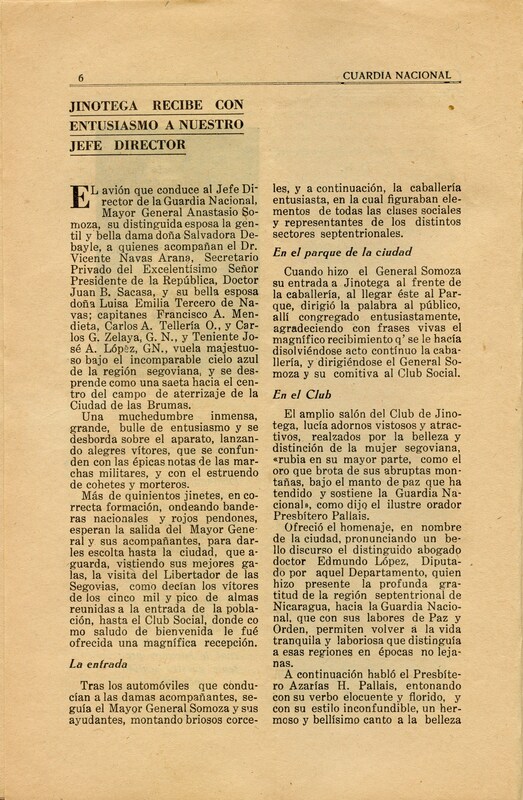 Julio 1934, p. 10. 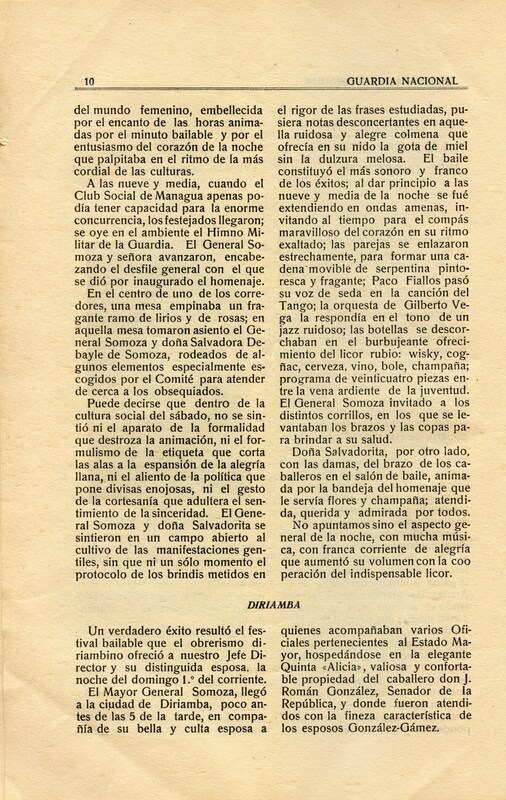 "Los Grandes Homenajes a Nuestro Jefe Director" (p. 2). 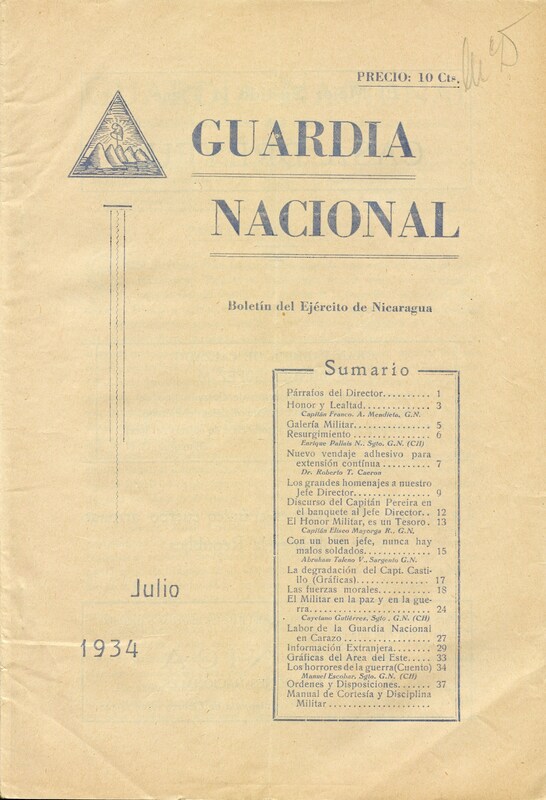 Julio 1934, p. 11. "Los Grandes Homenajes a Nuestro Jefe Director" (p. 3). 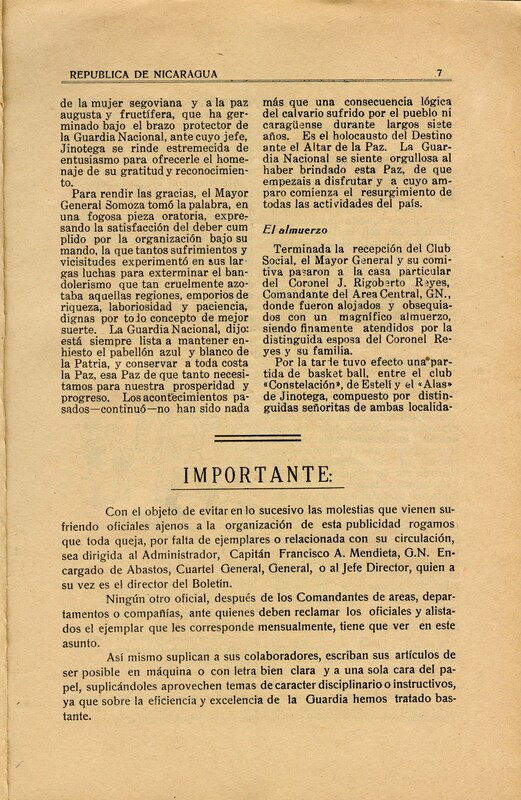 Julio 1934, p. 12. "Discurso del Capt. Pereira en el Banquete al Jefe Director." Agosto 1934. Portada & Sumario. Septiembre 1934. Edición Completa. 49 pp. 25.4 MB. 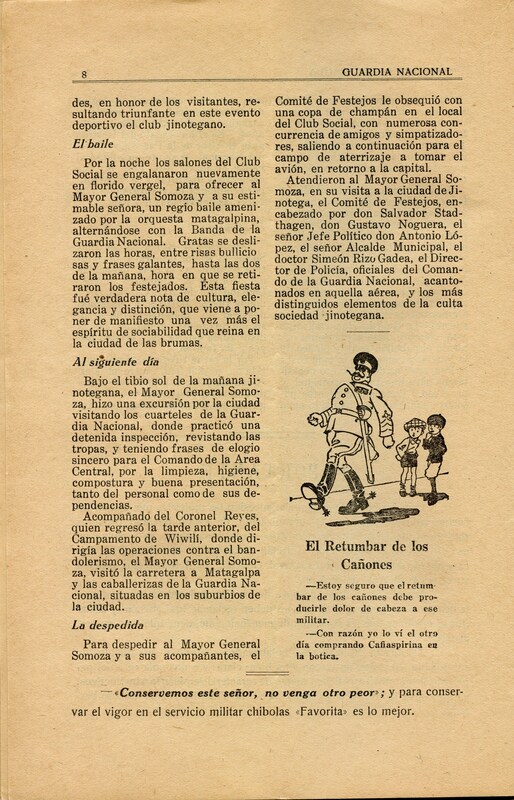 Septiembre 1934, p. 6. "Declaración del Dr. Julián Irías sobre la Personalidad del General A. Somoza." 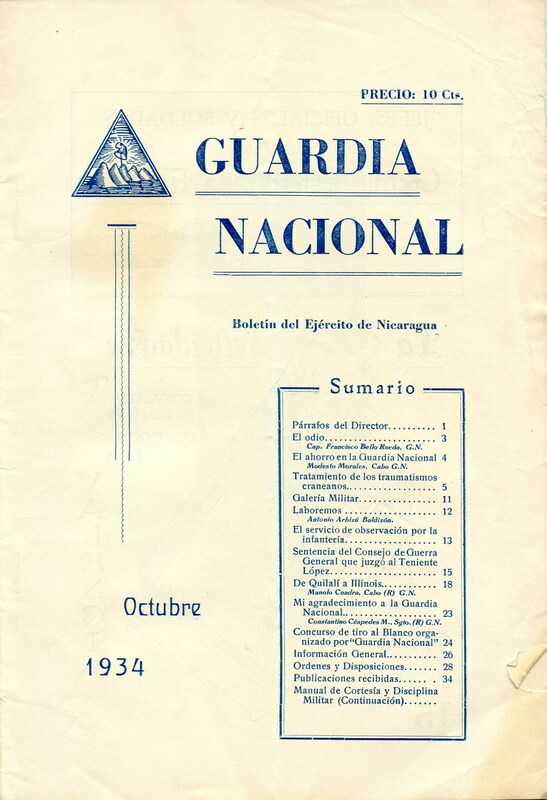 Octubre 1934. Edición Completa. 49 pp. 23.5 MB. 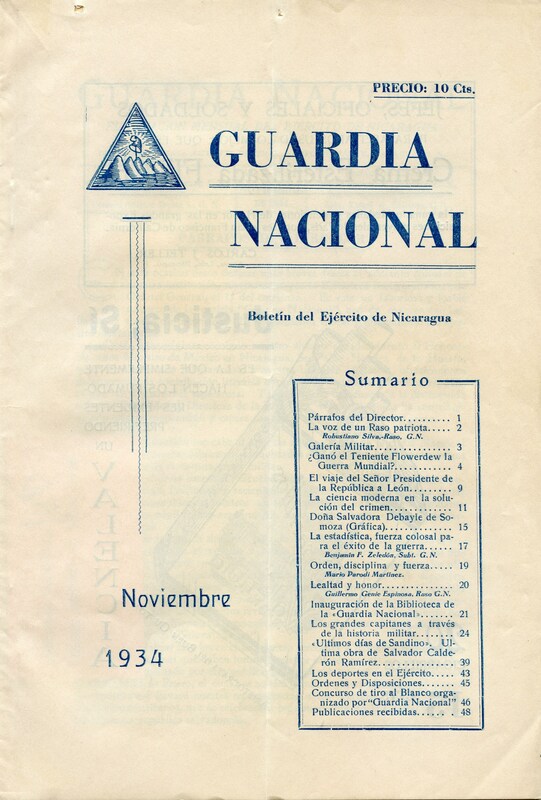 Noviembre 1934. Edición Completa. 49 pp. 26.9 MB. 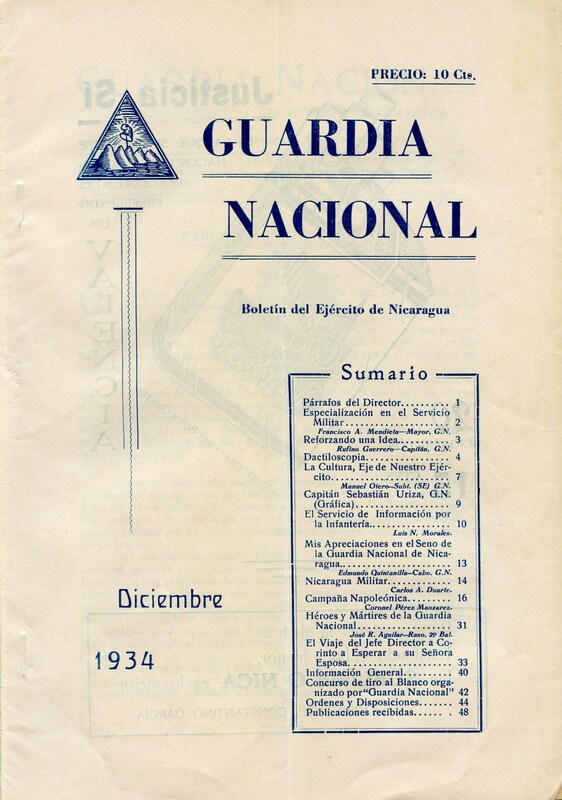 Diciembre 1934. Edición Completa. 50 pp. 26.3 MB. Diciembre 1934. 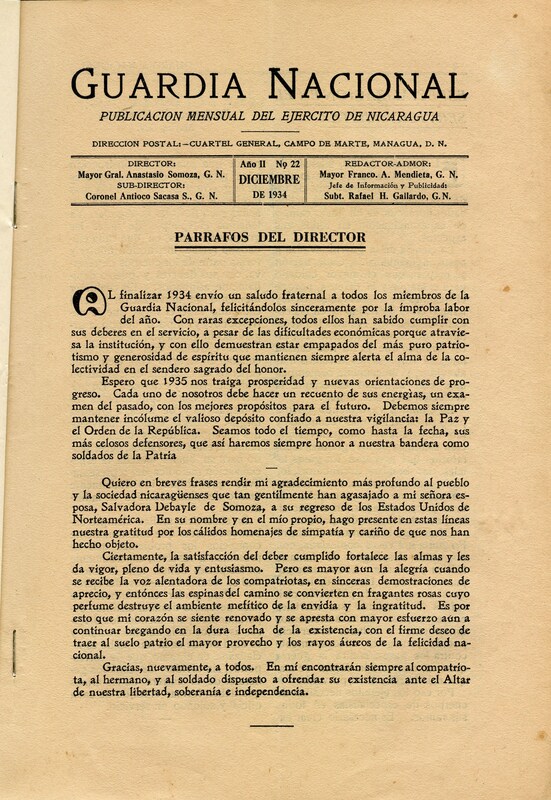 "Párrafos del Director." 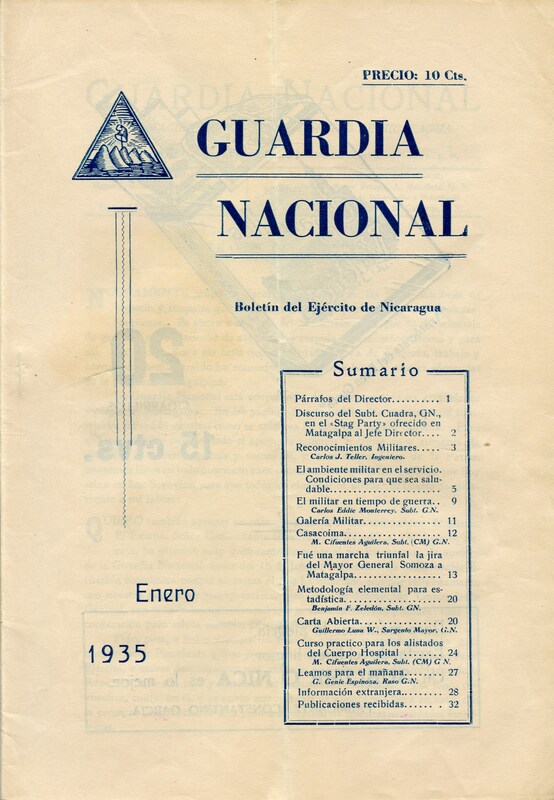 Enero 1935. Edición Completa. 34 pp. 17.8 MB. 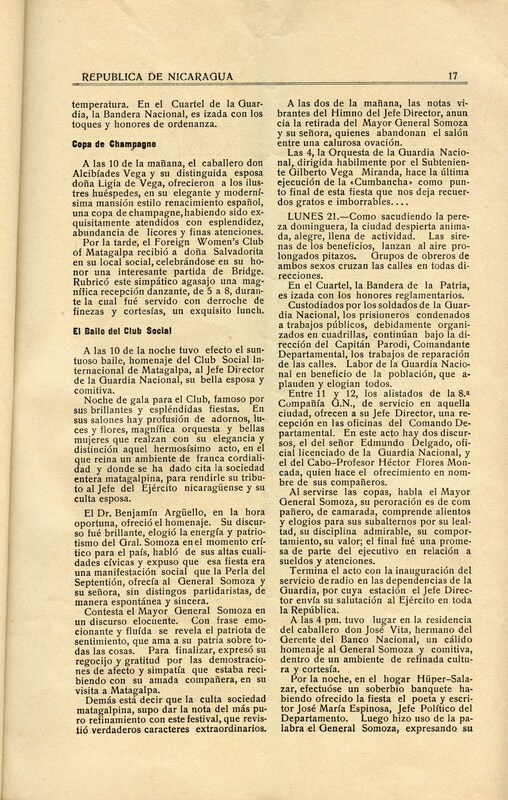 Enero 1935, p. 13. Rafael H. Gallardo, Subt. G.N., "Una Marcha Triunfal Fue la Gira del Mayor Gral. Somoza a Matagalpa" (p. 1). 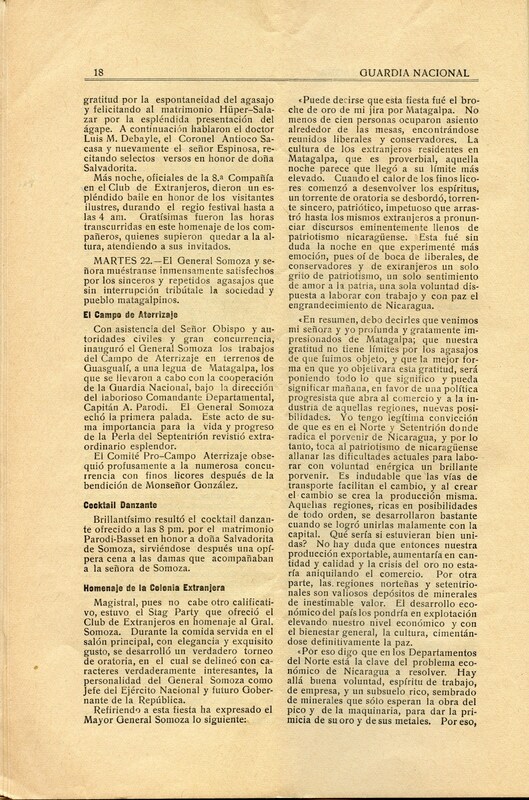 Enero 1935, p. 14. Rafael H. Gallardo, Subt. G.N., "Una Marcha Triunfal Fue la Gira del Mayor Gral. Somoza a Matagalpa" (p. 2). 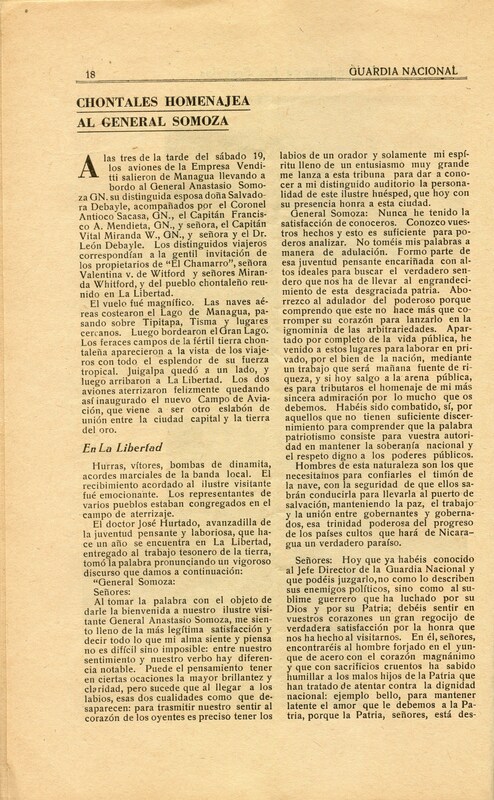 Enero 1935, p. 15. Rafael H. Gallardo, Subt. G.N., "Una Marcha Triunfal Fue la Gira del Mayor Gral. Somoza a Matagalpa" (p. 3). 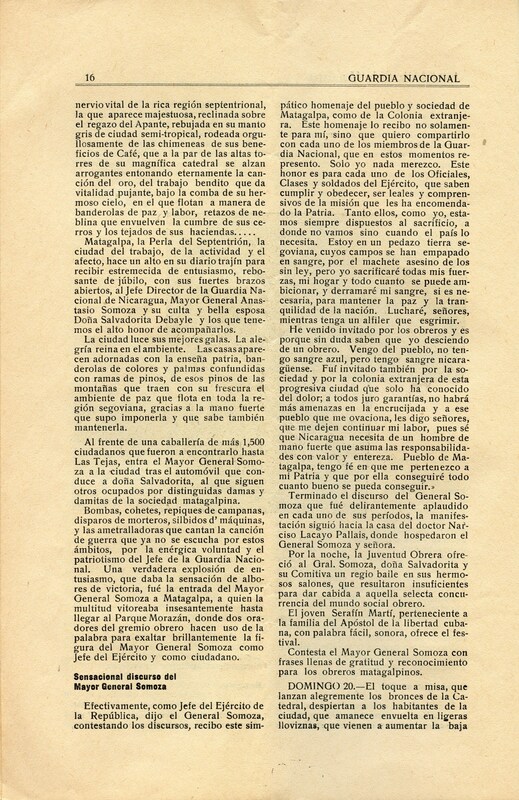 Enero 1935, p. 16. Rafael H. Gallardo, Subt. G.N., "Una Marcha Triunfal Fue la Gira del Mayor Gral. Somoza a Matagalpa" (p. 4). 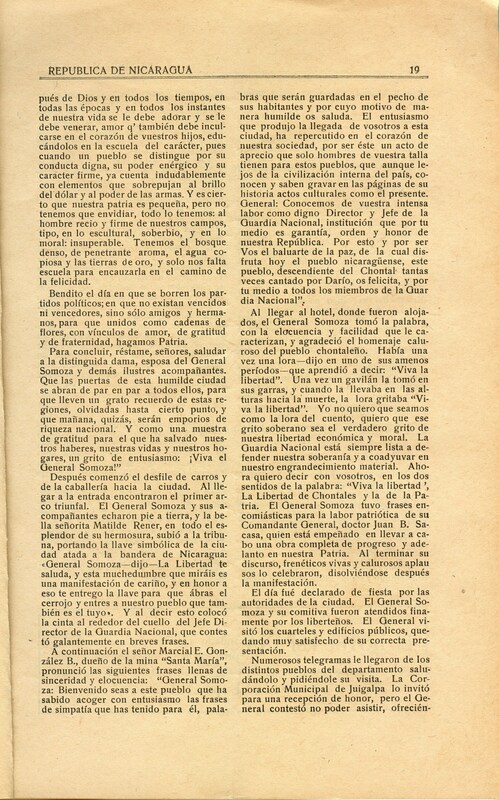 Enero 1935, p. 17. Rafael H. Gallardo, Subt. G.N., "Una Marcha Triunfal Fue la Gira del Mayor Gral. Somoza a Matagalpa" (p. 5). 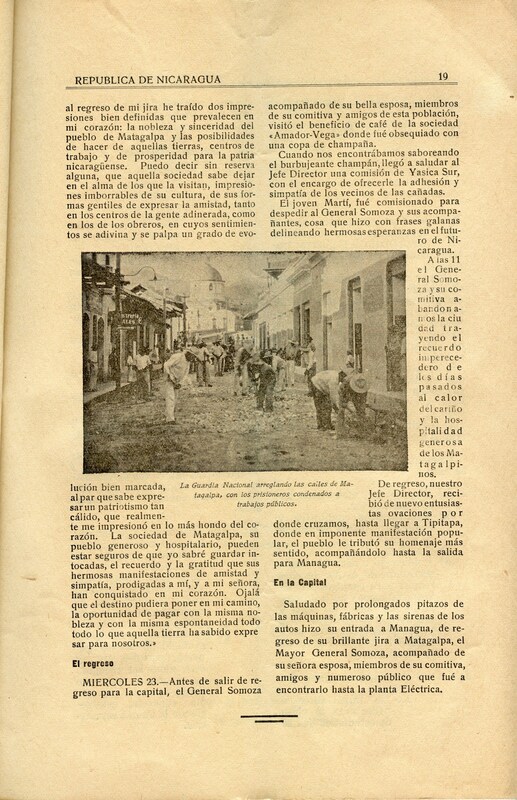 Enero 1935, p. 18. Rafael H. Gallardo, Subt. G.N., "Una Marcha Triunfal Fue la Gira del Mayor Gral. Somoza a Matagalpa" (p. 6). 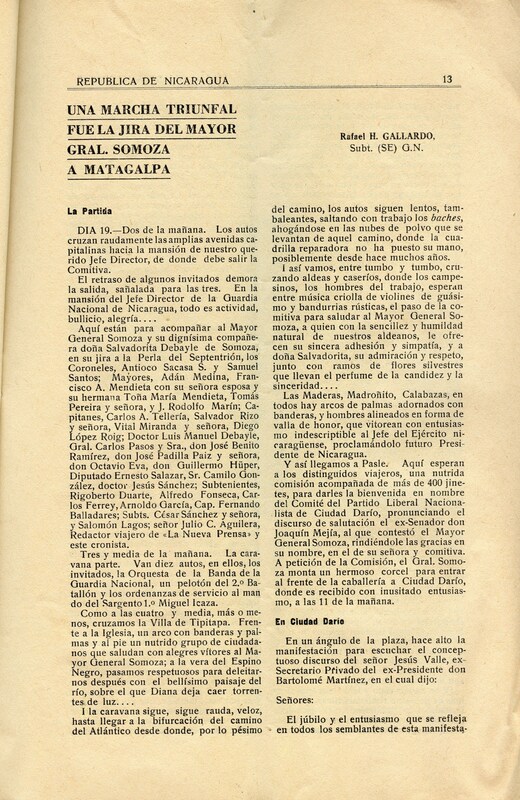 Enero 1935, p. 19. Rafael H. Gallardo, Subt. G.N., "Una Marcha Triunfal Fue la Gira del Mayor Gral. Somoza a Matagalpa" (p. 7). Febrero 1935. Edición Completa. 40 pp. 22.8 MB. 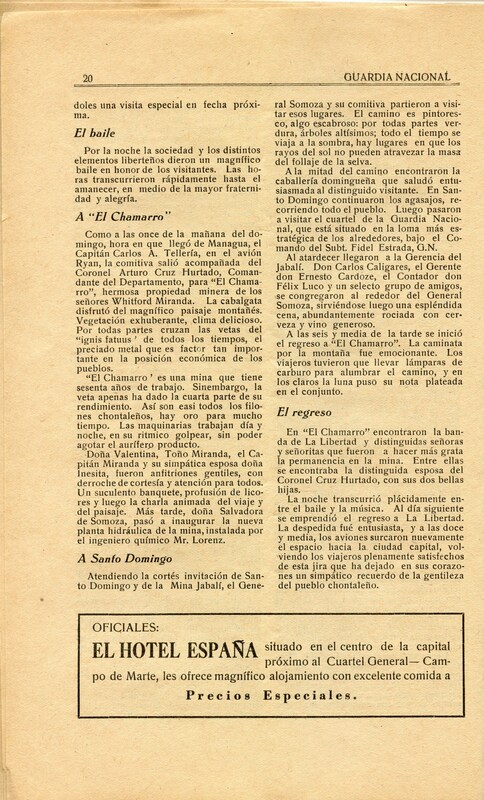 Febrero 1935, p. 1. Photograph of Jefe Director Mayor General Anastasio Somoza. 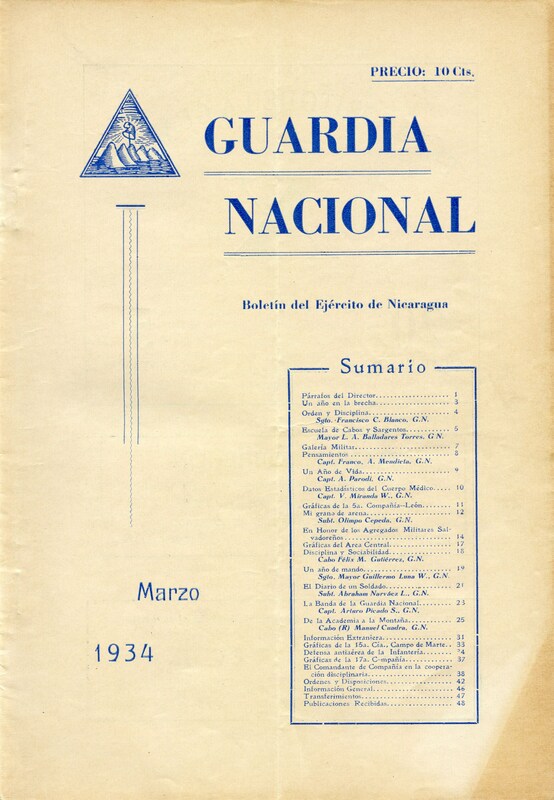 Febrero 1935, p. 2. 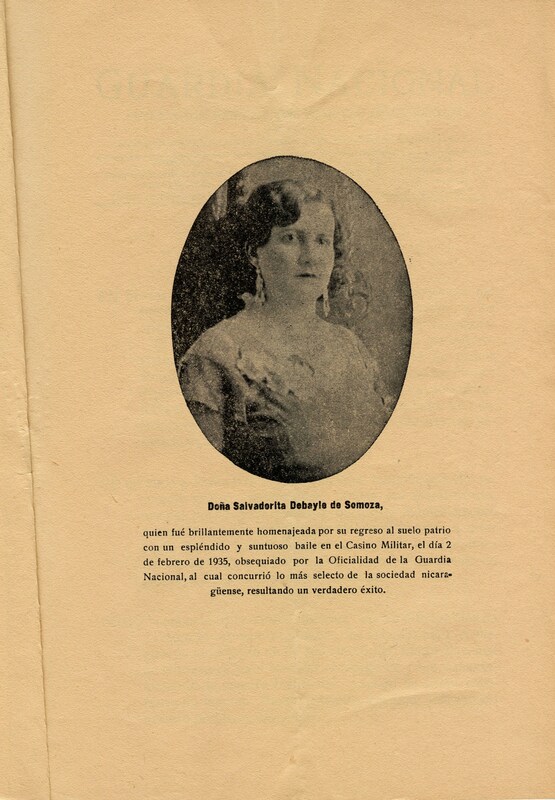 "Doña Salvadorita Debayle de Somoza." 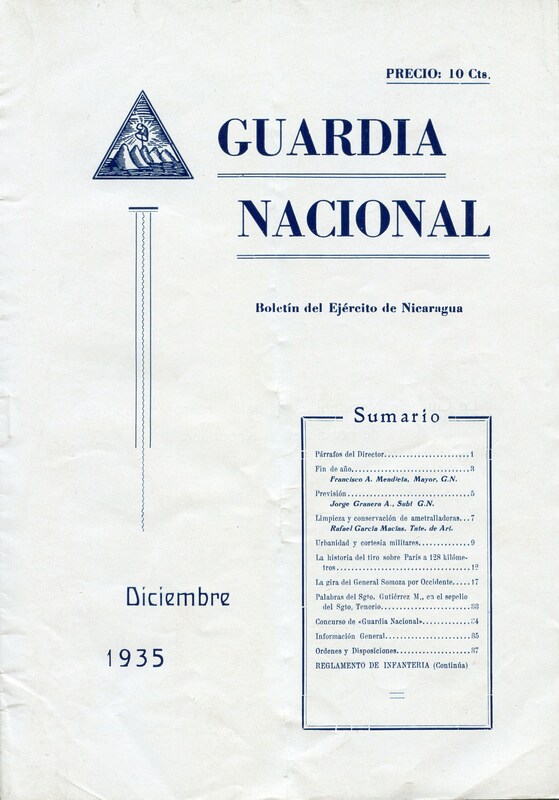 Diciembre 1935. Edición Completa. 59 pp. 26.8 MB.